I intended posting this a couple of weeks ago, but things got in the way. So, without further delay, here is some Mountain Goodness. Clicking the thumbnails should biggify. Here is the beginning of our epic hike. Please remember that I had cracked my rib only a few days earlier. 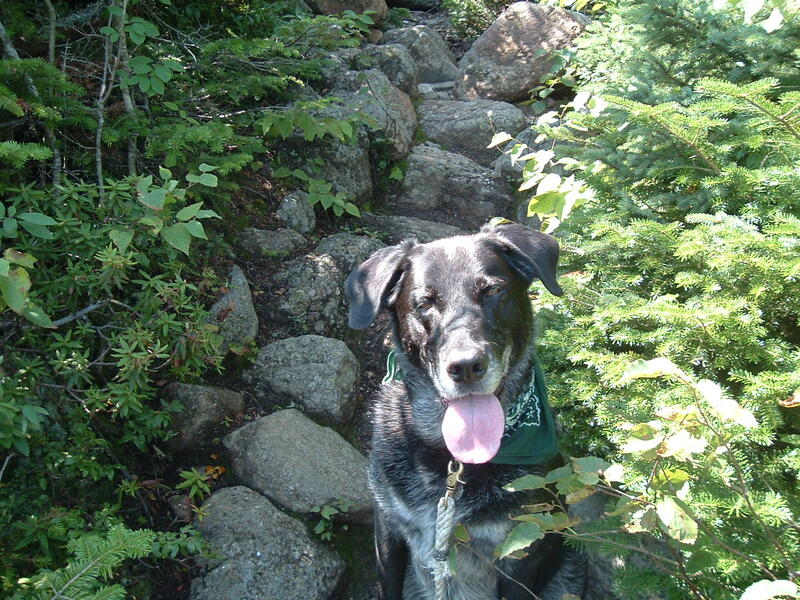 Muttboy taking a break before the climbing gets really steep on the Glen Boulder trail. He is a photogenic beast. At timberline, with the Whites spreading out majestically to the east. 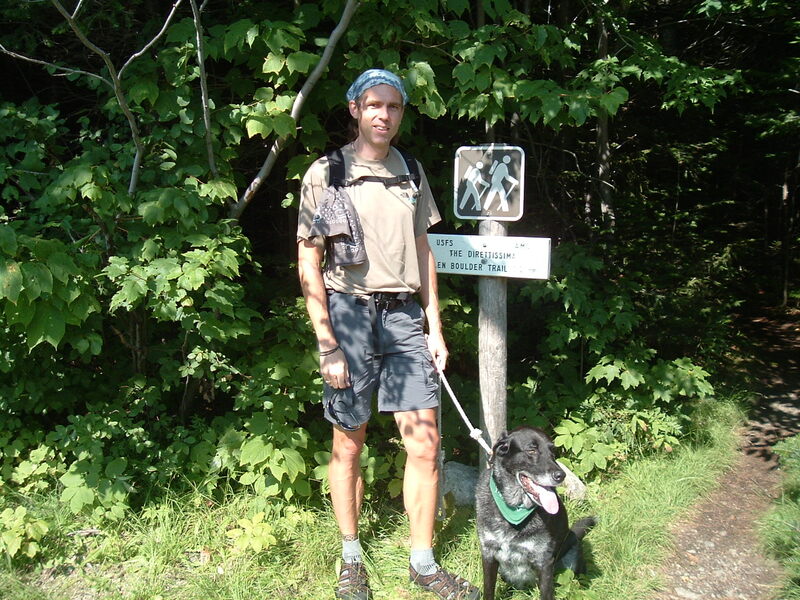 The rugged mountain man and his faithful canine companion. The rugged mountain woman wending her way through the alpine scree. On top of the world. It’s disorienting to climb all morning in a rugged wilderness to find yourself at a major tourist destination with a parking lot and fat tourists in flip flops wandering around the gift shop. 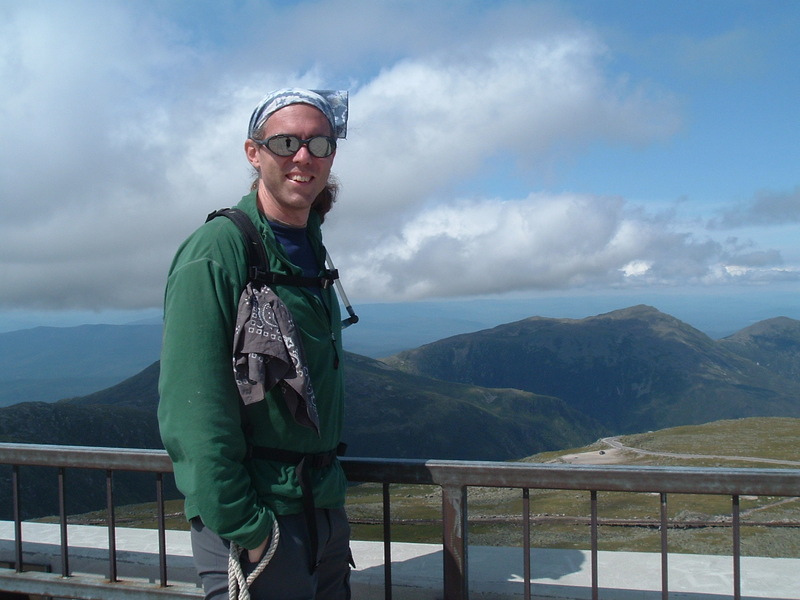 Note the rugged mountain man look, complete with Julbo glacier glasses and a cloud colored bandanna. 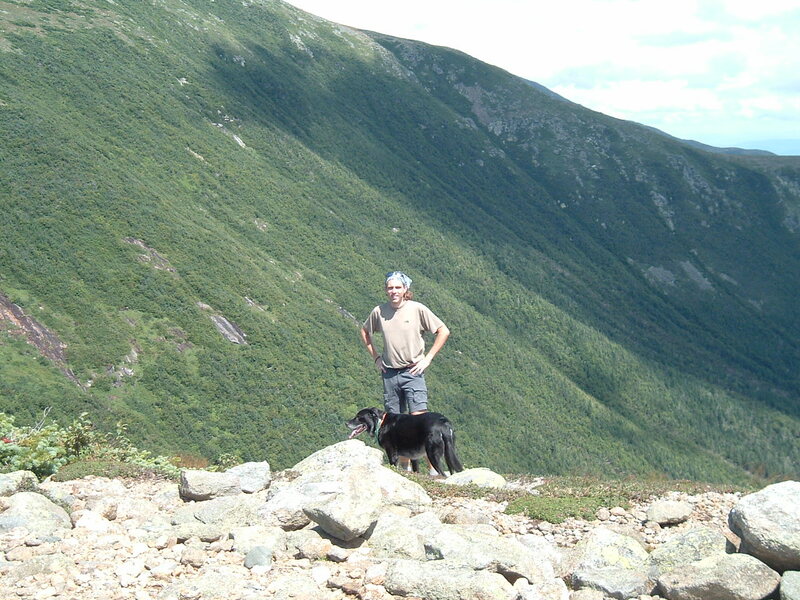 In Tuckerman Ravine, Muttboy starts to show some signs of fatigue. He is a tough mountain dog, though, and soldiers on. 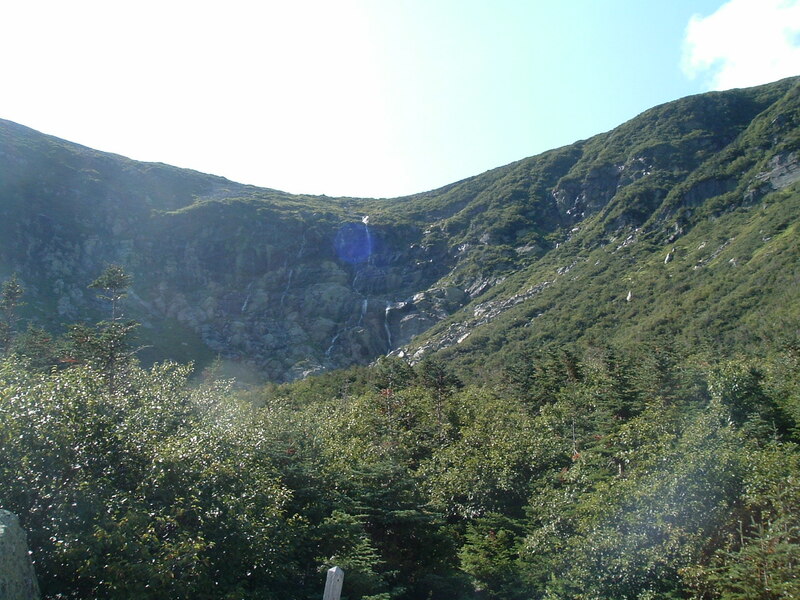 The way down Tuckerman Ravine is steep. It requires climbing from boulder to boulder as if walking down a giant, ungainly staircase made of stone. The Bowl. A little photo miserably fails to capture the gandeur of the scene. You can easily see how the poets were inspired by the sublime sight. At the bottom. Muttboy looks ridiculously fresh. 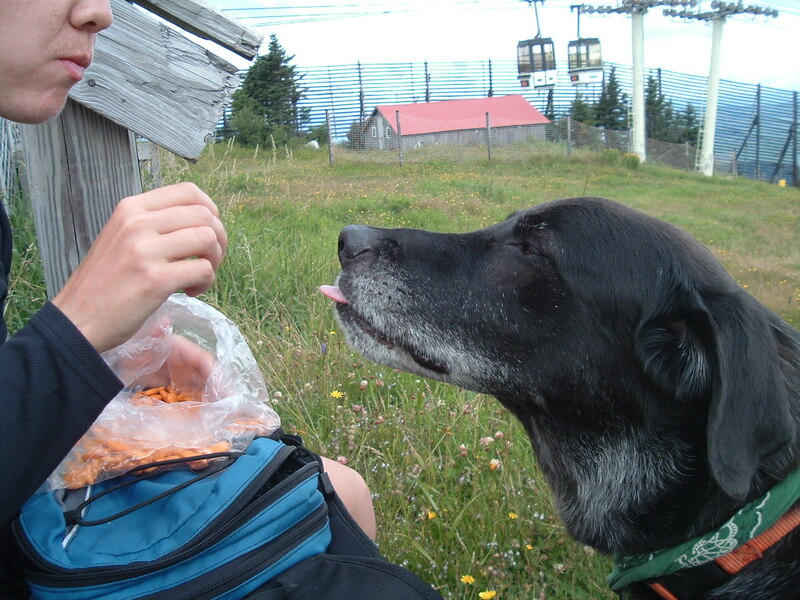 And here he is a couple of days later, begging a treat on top of Stratton Mountain. 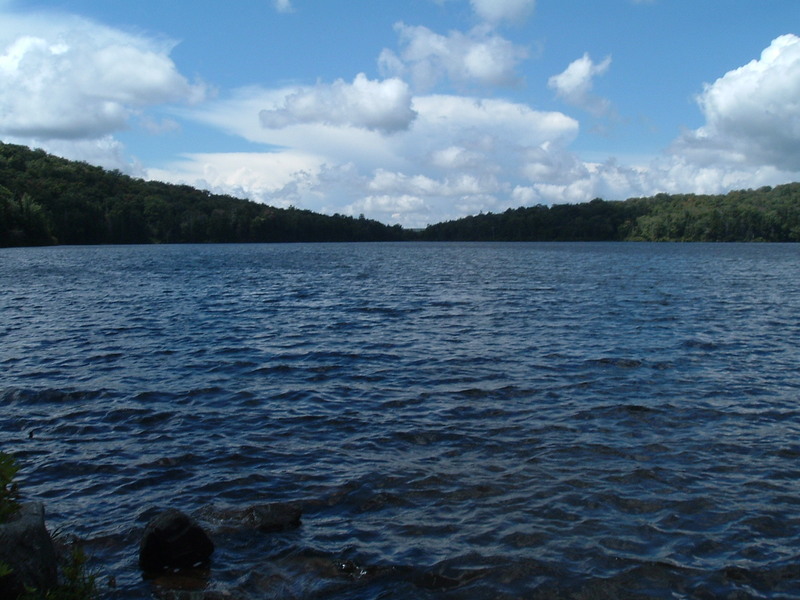 And let’s end with a picture of serenity–Stratton Pond, one of my favorite places in Vermont. We were ambling down the trail when Muttboy suddenly started sniffing the air, and his face wrinkled in intense concentration. He huffed a couple of times and began circling the trail, his nose held high. Then he darted to the left, moving in fast, tight circles as he tried to lock in on the scent. Whatever it was, it was making him crazy. I looked up at the low ridge and saw a fox running away to the north. It was not moving in a panic, but it was not dawdling, either. As I watched, it dodged around a tree and disappeared into a mountain laurel thicket. At that moment, Muttboy grabbed the scent trail and started his zig-zagging chase. I called but he was too intently focused, so I had to call again, raising my voice and letting him know I was serious. He sprinted back to me, breathing hard, his tongue lolling crazily, and his eyes incandescent with excitement. 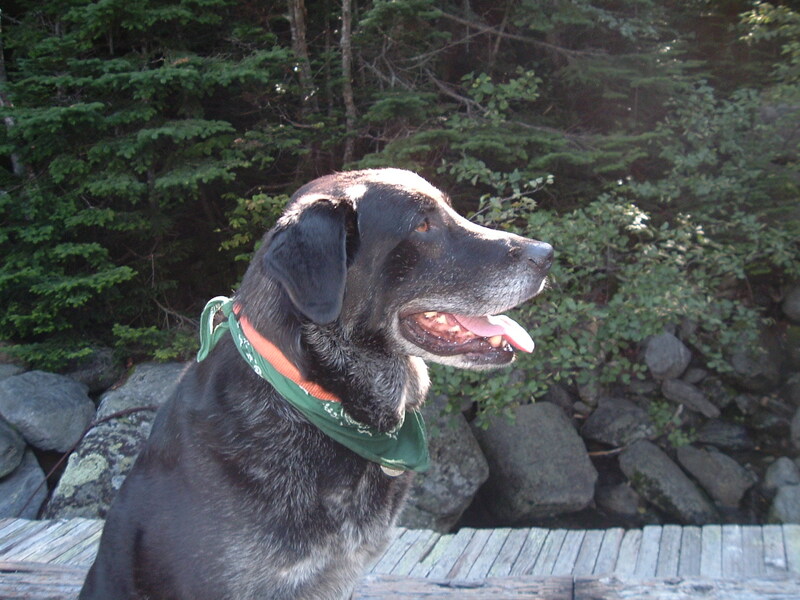 We continued walking, Muttboy all the time staring off to the north, hoping to catch another glimpse of his quarry. Scrambling over the big fallen oak, we moved away from the small valley where the fox was and ascended a low ridge. 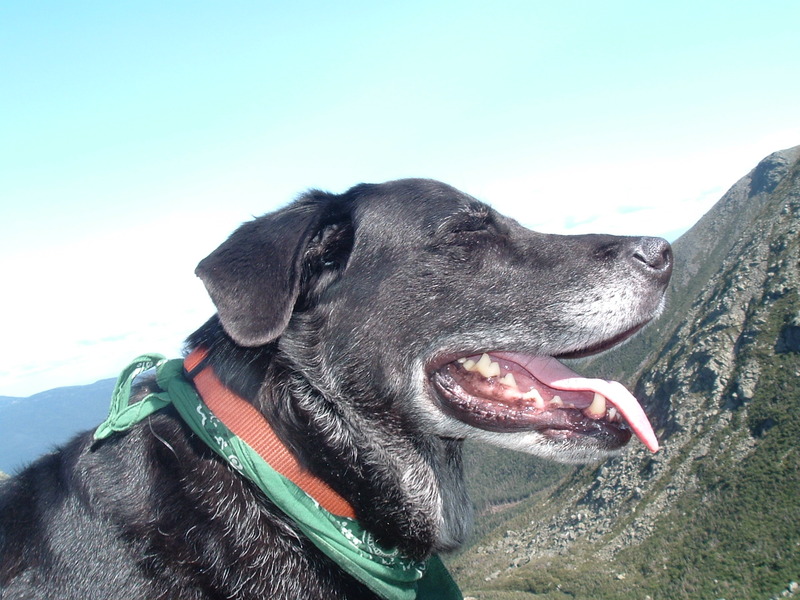 Then we were back on more heavily-traveled trails and Muttboy’s panting slowed, became less excited. Soon, though, his eyes widened and he held his nose high as he darted back and forth over the trail. Clearly, he had picked up another scent. I looked, to the south this time, and saw a big bushy tail disappear over a high rocky ridge. I wanted to get a closer look this time, so I called Muttboy to me and we ran up the hill, leaping from boulder to boulder and over jagged, broken branches. 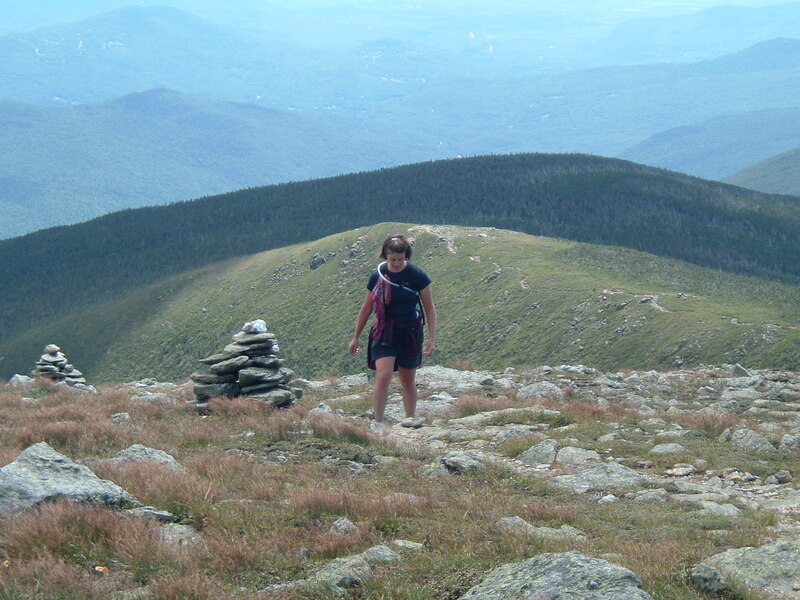 We came to the ridgeline, and I saw two possibilities. A faint game trail ran to the right, up the ridge, while another, even fainter trail tumbled down the rocky cliff. Muttboy was clearly in favor of the higher trail, and he sniffed anxiously, seeking the fox. That way, though, looked almost impassible for someone my size. Though a dog or a fox could easily dart under the tough, grabbing branches of the mountain laurel thicket, I would have to double over and even crawl in some places. 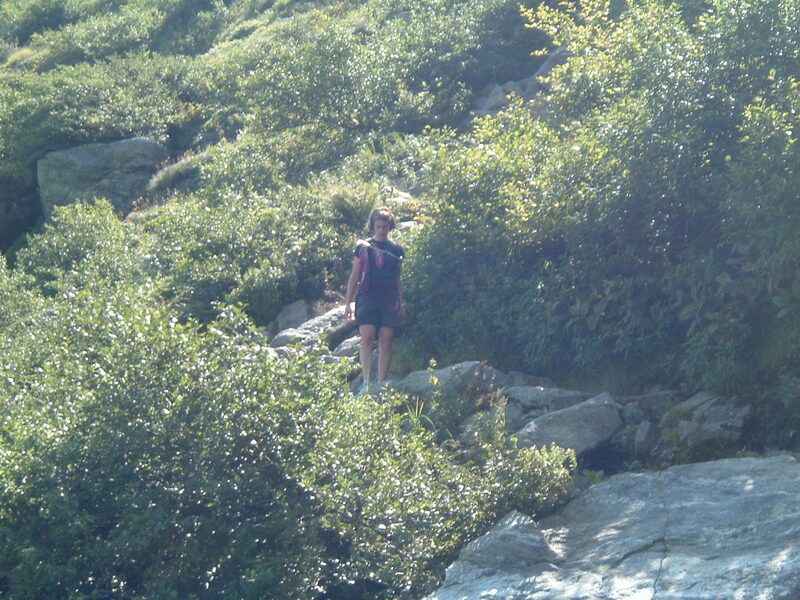 I decided to give up the chase, and scrambled down the tumbled rocks to the trail below. As we trudged along the trail, I looked up at the top of the stone escarpment above me. There it was. The fox was lying on a flat rock, its bushy tail curled in front of it, gazing at us intently. I stopped and looked at it. It stared back at me. Its red coat looked thick and rich, and its inscrutable gaze lay on me steadily. “What are you doing up there?” I called out. The fox did not deign to respond, but kept watching me. We stood, eying each other for several minutes, Muttboy wondering the entire time what was going on. The wind was blowing the wrong direction for him to catch the scent, and I could not make him look the right way. Every time I pointed he looked in a different wrong direction. I started to walk toward the rocky cliff to get a closer look, but this made the fox uncomfortable, and it vanished in the laurel. I returned to the trail and resumed my walk. A moment later I again looked across the shallow declivity to the tall thrust of stone. There, on a large boulder, stood the fox, watching us again. I stopped to look again, and the fox crouched on the rock. It saw me still looking, so it carefully backed up until just its eyes and ears showed above the edge of stone. “I can still see you,” I called, and it backed up a little more. Just its red ears showed above the boulder. I laughed at this attempt at sneakiness, and the ears twitched. I imagined the annoyance the fox felt at being seen. Muttboy and I crossed to the bluff and started climbing noisily. The fox vanished again, and, thought I looked for a red, furry spy, I could not see it anywhere. We returned to the car and then to home, happy with our fox chase. Standing on the trail, staring into the eyes of the fox only fifty feet away, was beautiful. The fox, apparently, was as curious about me and Muttboy as we were about it. I felt a moment of communion with something wild. Every morning Muttboy and I take a walk in a big park about ten minutes away from our house. There is one spot near the end of our walk where the trail turns to the right and drops down a little hill before running into the boat launching area. Every day after I make the turn and start down the little hill, Muttboy stops behind me and waits for me to stop and look back at him. When I do, his eyes light up and he howls at me. I call him a silly dog and we continue on the walk. I do not know what this wild howl means, but it must mean something since he does it every day at the same spot. Maybe he realizes that it is the last turn before we head back to the car, and he wants to walk longer. Maybe he thinks that is a good spot to play some sort of dog chase game (sometimes I do chase him here). Maybe he just likes to express his joy at being in the woods. Right after my dad got sick, I started making plans for what we would do when he recovered. Since he had never been to New England, of course he would come up and spend some time in Connecticut. As I walked through the woods last winter I thought about what we would do when he visited. I knew that he would want to tromp through the fallen yellow leaves with me and Muttboy. He’s been gone seven months. He never did make it to New England, but now I walk with him almost every day. It’s my voice that sounds so much like his and my laughter that echoes him. Sometimes I wonder if I am the ghost. Today, as usual, Muttboy and I went for our morning walk in the big park a few miles from home. Muttboy was in a sort of rambunctious mood. Before we left, I was sitting here at my computer, reading the news and various blogs, but he was not at all content to wait until later. He sighed heavily. I looked at him, and he was watching me carefully, so I knew that was a theatrical sigh. Then he started grunting. When I ignored that, he placed a paw on my shoulder. I got the hint. It was time to go for our walk. 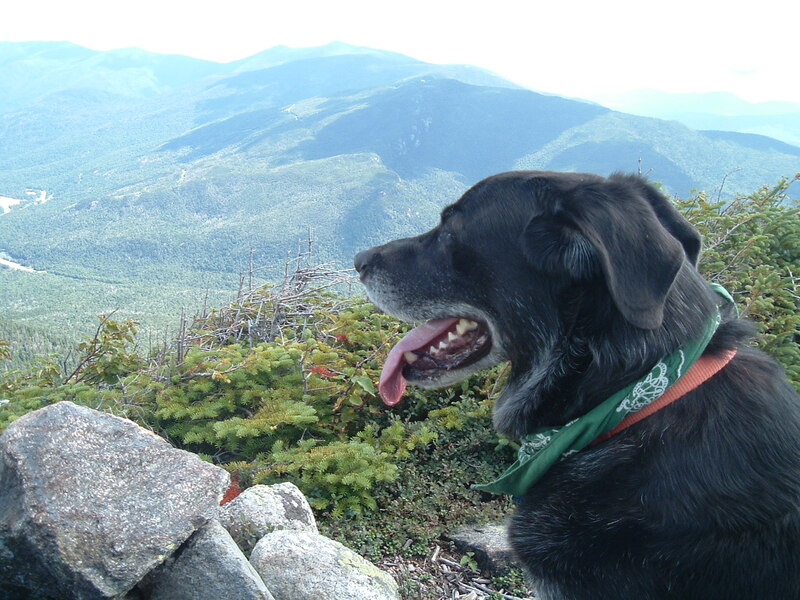 Because of Muttboy’s excess of energy, I decided to go on a little longer hike, and to make it more interesting, I veered off the trail after about a mile and started bushwhacking. For a time, I followed familiar features–the ridge of rocks, the seasonal stream (dry now), the huge toppled oak. Then I took a left turn and found myself in a swamp. Since the weather has been dry for several weeks, the swamp was firm mud, so the footing was easy. However, the thick vines, leaning tree trunks, and clinging plants made the passage tortuous; I had to walk bent over double to squeeze through some passages. Finally, I made it through with only one huge gash on my ankle. Soon we crossed a trail carpeted in fallen yellow leaves. We followed that until it ended in a pile of rocks and someone’s backyard. After some backtracking, we cut to the right, dropping through a forest of ferns turning a pale, silvery gold and onto another path. This was a new path for me, and I felt embarrassed–I thought I knew every single trail in this park. The new path widened into perfectly gorgeous doubletrack, winding and dipping gently along meandering stone walls. I felt I had discovered a new world, and I was sure that almost no one ever walked on this trail. After a mile or so, I realized that I really had no idea where I was. I knew I was somewhere in the north end of the park, and I suspected that I had actually walked out of the park. But, after the path we were following twisted and turned a dozen times, I did not know where we were in relation to the paths I did know. We kept walking, though, and eventually came to another pile of stones and someone else’s backyard. We backtracked again, bushwhacked some more, and finally, after almost an hour of wandering, made it back to recognizable trails. Getting lost was fun. I knew I could not get in too much trouble on the paths in the park, and if I kept walking I would eventually find my way out. There was something magical about discovering this perfect path, the old stone walls, the turning trees–an undiscovered wilderness. It was as if I had found a new country in my own yard. Muttboy, too, felt the excitement. he loves to explore new places with new smells, and he frolicked and sprinted as if possessed. We will return for more adventures.